We are excited to announce that Glenn Jolly, Technician and Electronics Shop Supervisor, has been named a 2017 recipient of the President’s Staff Award! This award recognizes the personal achievements and contributions that our staff make to UBC, and to the vision and goals of the university. Glenn’s practical electronic and technical knowledge, and his every-day mentorship and advice to colleagues, undergraduate and graduate students alike, has had a transformative influence on the department. Glenn is the unsung hero behind many undergraduate laboratories, graduate research projects, and in the delivery of outstanding education programs. His genuine passion for his work has created an outstanding learning experience of countless undergraduate student and graduate students in Mechanical Engineering. 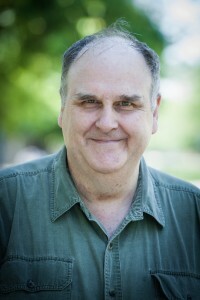 Glenn regularly contributes to technical content in undergraduate curriculum and has had a hand in instrumentation aspects of most of the custom-built teaching lab apparatus in the department. As an electronics and instrumentation shop technician, Glenn has established himself as the go-to instrumentation expert, not only with students, but also with professors outside of Mechanical Engineering.